Originally published under the title "Turkey: A Thuggish Ramadan." Government officials in this eastern city are mulling the possibility of airdropping food, beverages and cigarettes onto busy streets, hoping that this may break some fasters' resistance to hunger, thirst and tobacco needs. The city has been in shock as, already one week into the holy month of Ramadan, no one has been publicly beaten up for eating, drinking or smoking. Zaytung's mocking was not without a reason. "If one tried to eat in a restaurant [in some parts of Turkey] during Ramadan, one may be insulted or even physically harmed. Indeed, each year there is an incident of an unobservant college student being beaten up or even murdered in the southeast for not fasting during Ramadan," observed Soner Cagaptay in a 2008 article at the Washington Institute for Near East Studies. In 2010, as art lovers drank sangria out of plastic cups and contemplated iconoclastic pieces of art, a group of locals in central Istanbul attacked them with pepper gas and frozen oranges. For an hour, they smashed windows and injured dozens, including visiting foreigners. 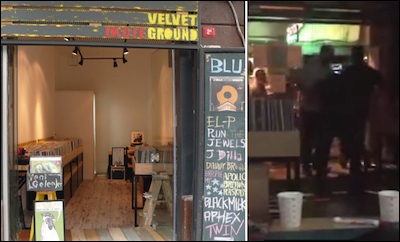 On June 17, a group of men attacked the Velvet Indieground record store in Istanbul several people inside were drinking alcohol during Ramadan. At right, the shop's Korean owner is seen being beaten by some of the attackers. The attackers justified themselves by saying that drinking alcohol, especially outdoors, violated Islamic rules. Then Prime Minister Recep Tayyip Erdogan, now president, said, "Such incidents occur everywhere in the world." Nearly six years after that incident, a mob of men carrying sticks and bottles attacked a group of Radiohead fans at a record store owned by a South Korean man. The fans had been holding a listening party of the band's music, again in central Istanbul. Video footage of the incident shows an angry man storming into the store, shouting curses and threats and most of the people hastily leaving. A waiting mob then reportedly attacked the group and the door of the record store was smashed, although fortunately there were no serious injuries reported from the assault. Once again, the mob was angry because "infidels" had dared to listen to music and to drink during Ramadan. "We were beaten by more than 20 men with pipes in their hands, beer bottles were broken on our heads, I don't even know how we made it out," One of the victims explained on social media. Three of the attackers were detained but judicial authorities later released all of them. But that was not the entire show during the first two weeks of Ramadan in Turkey. The thugs are not always "unofficial." The Istanbul Governor's Office banned the LGBT Pride March, which was set to take place between June 19 and June 26 in Istanbul's Taksim Square. Officials cited "security concerns and public order." The decision to ban the march had been prompted by threats from another mob of men. The Alperen Hearths, an ultranationalist/Islamist youth organization, had initially vowed that it would prevent the march, but later stepped back, saying that its members only wanted their religious values to be taken into consideration. Earlier than that, an Islamic youth group also threatened the planned march. In Turkey, the holy month traditionally has the potential to illustrate the Islamists' thuggish intolerance to "the other." It is a curious intolerance. While the Koran commands Muslims to abstain from alcohol, it does not command them to attack those who do not. Observant Muslims stubbornly refuse to understand that while the Koran commands them to abstain from alcohol, it does not command them to attack those Muslims (and non-Muslims) who do not do so. Could conservative Muslims be reacting to alcohol in fear that drinkers may disturb them and their families? What do people normally do if drunken (or sober) people disturb an individual? They call the police. Why then do some Muslims attack those who do not fast? Because the Koran commands them to break the bones of those infidels? Not necessarily. In fact, the Koran clearly tells the faithful that sinning does not make a Muslim an apostate and that "there is no compulsion in religion." So why do they ignore the essential Koranic teaching and feel urged to fight the infidel whom the Koran says is not an infidel? The dirty looks at (lucky) drinkers and the punches in the faces of (less lucky) ones have been at the core of the "Great Turkish Divide," after the ruling Islamists deeply polarized society since they came to power in 2002. It has become the observant Muslims' self-granted authority collectively to forbid evil and command good, rather than just individually to avoid evil and choose good. There is little, if any, reason to expect Turkey's observant Muslims to learn to respect non-Muslims and other Muslims who practice the same religion in different ways.